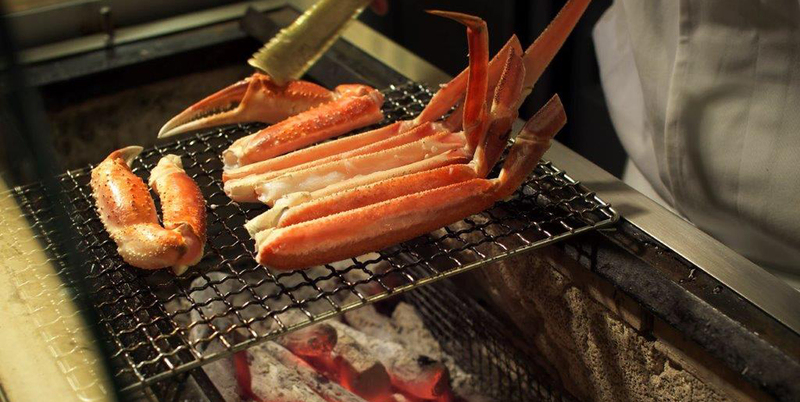 The Japanese word sumibi or sumibiyaki refers to food that is grilled over a charcoal fire. Charcoal fire grilling adds a rich, smoky flavor to each dish and enhances the taste of the "umami"; a deep, almost indescribable taste known in Japanese traditional cuisine. The Japanese word "kappo" simply means to cut foods with a knife and cook with fire, and it is typically associated with traditional Japanese cooking methods; to cut, boil, stew & fry. Over time, kappo has come to refer to traditional and more sophisticated Japanese cuisine, featuring foods such as sliced raw fish, steamed fish, and seasonal vegetables. In a kappo restaurant, the chef carefully prepares the dishes as the customers watch — slicing sashimi, roasting fish, ladling simmered vegetables from pot to dish. A Kappo chef caters to the customers wish and is trained to master numerous ways of cooking as well as understanding the seasonality of food, the quality of ingredients and the presentation. In order to gain extensive skills as a master Kappo chef, it takes many years of training taking at least 10 to 15 years of persistent training. With charcoal fire grilling, even though grilling food appears deceptively quite simple, there is more than meets the eye, and even slight modifications to the way the food is cooked producing entirely different tastes and textures. Through trial and error and chef Yamamoto's years of experience as a chef, a great deal of hard work went into learning about the best ways to cook specific food to obtain sublime flavors and an exquisite balance of taste. Many hours of meticulous preparation are essential before the food is even ready to be cooked. Sumibiyaki Kappo cuisine is all about savoring the pure beauty and rich flavors of food in a lively atmosphere, as well as the superb quality of the seasonal ingredients and the skill of the chef.